The Cro-Magnons, the first anatomically modern Europeans, are named after a rock shelter near Les Eyzies in Southwestern France. The correct technical term is ‘anatomically modern humans’ (AMH). 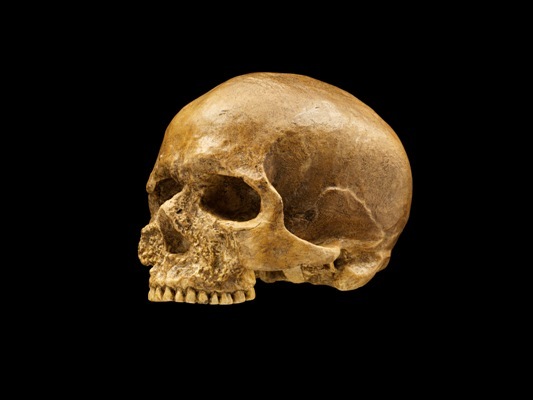 We now know that small numbers of them had settled throughout Europe by 45,000 years ago. From the beginning, there were signs that Europe’s first artists were cognitively different from their Neanderthal neighbours. As a case in point, let us look first at the Löwenmensch, ‘the Lion Man’. This is a man with a lion head, who appears to straddle the human and animal realms, as if he has the ability to transform himself from a hunter into the hunted. There is something mystical here, a connection between the living and the supernatural quite unlike anything we have encountered before. The Lion Man is the oldest known example of an imaginary being. Löwenmensch comes from Hohlenstein Stadel (‘Hollow Rock Barn’) cave, which lies in the cliff of that name at the southern edge of the Lone Valley in the Swabian Alps of southern Germany. In 1939 archaeologists Otto Völzing and Robert Weltzel discovered an occupation layer in the cave, remarkable for its numerous fragments of mammoth ivory. The outbreak of World War II abruptly ended the excavations, which did not resume until 1954, when they lasted for another seven years. The layer proved to be more than 34,000 years old. The Hohlenstein collections lay virtually forgotten in the Ulm Museum until the late 1960s, when Joachim Hahn began piecing together some larger ivory fragments, which had come from a niche in the cave. To his astonishment, they formed a human figure with a lion’s head. When Elisabeth Schmid and Ute Wolf finally completed the reconstruction in 1988, they had pieced together an elongated carving just over 11 inches (28.1cm) long. The left arm bears slanting marks that may represent scarring or tattoos. The upright posture is definitely human, but the feet seem pawlike. They do not allow the figure to stand on its own, as if it was placed in a hole or leaned against something. Almost certainly, the figure is male, for there are no breasts. The Lion Man epitomizes the fluid mental boundary that separated late Ice Age people from their prey, for they, among the first of all humans, were aware of the supernatural realm that surrounded them on every side.